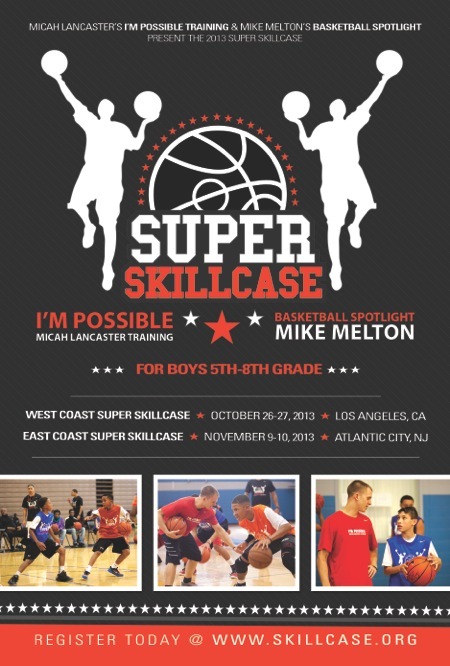 Basketball Spotlight and I’m Possible Training have joined forces to bring you the Middle School Hoops Event of the year! The 2013 East & West Coast Super Skillcases, directed by world renowned skills coach, Micah Lancaster, will feature the same advanced teaching and instruction that is offered at Nike skill academies and NBA workouts. Micah Lancaster has directed a Nike related training academy with Kobe Bryant and has worked with NBA players such as Dwyane Wade, Kyrie Irving, Mario Chalmers, Evan Turner, Avery Bradley, Ben McLemore and Nolan Smith along with many others. Now players, grades five through eight, will have the same opportunity as NBA, college, and high school stars to experience Micah's innovative skill training and teaching techniques. The Skillcase is designed to make every player feel like they are alone in the gym with Micah. Players will be brought through elite skills training in the morning and a competitive five on five game sessions in the afternoon all under the watchful eye of Mike Melton's Basketball Spotlight. Camp video highlights and player analysis will be posted on www.bballspotlight.com at the conclusion of the event. Through innovative NBA skills training, organized competition, and the presence of Basketball Spotlight, each player will be given the unique opportunity to "skillcase" themselves by flashing their talents, improving their skills, and showcasing their game like never before! I'm Possible is elevating youth players’ skills across the nation with the right training tools and innovative training methodology to help them develop a vision to reach their goals. In 2013, the 3rd Grade Central Jersey Hawks and the 6th Grade AGAME Team USA both won the West Coast AAU National Championships (Level 1) in Las Vegas. All players from both teams were trained by I'm Possible's national trainers and several also trained at the 2012 Skillcase. At all of the 2013 AAU nationals from 2nd grade through 8th grade, many of the top performers were I’m Possible trained and Skillcase alumni.